Leaf retention: Evergreen in frost-free regions. Mature Size: 2-3' high and wide. 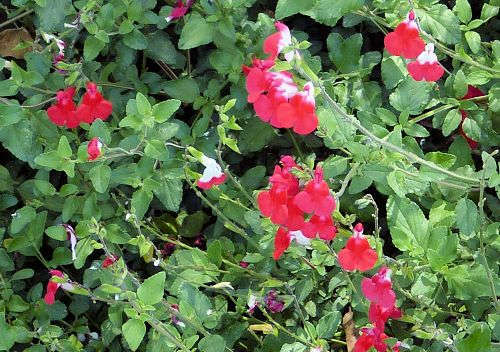 Flowers: Red to pink to white depending on cultivar, similar to Salvia greggii in shape. The cultivar 'Hot Lips' will be red, red and white, or white, depending on the temperature during flower bud formation. High temperatures result in solid red. Bloom: Fall, heaviest in winter, sporadically throughout spring. Leaves: Green, almost triangular, toothed edges, edible, aromatic. Wildlife: Attracts butterflies and hummingbirds. USDA hardiness zones: 9-10. This plant is killed to the ground by hard freezes. Drought tolerant: Yes, in part shade. Sun: One-quarter to three-quarters shade. Avoid full sun and full shade. Water once established: Once or twice a month in part shade. Weekly in nearly full sun. Soil: Well drained, pH 6.1-7.8 (slightly acidic to slightly alkaline). Prune: After last frost, or early winter in frost-free zones. Litter: Low except for winter cleanup. Uses: Ornamental. For culinary mint plants, see Low Water Culinary Herbs. This plant is a member of the Mint family (Lamiaceae). Another common name is Baby Sage. 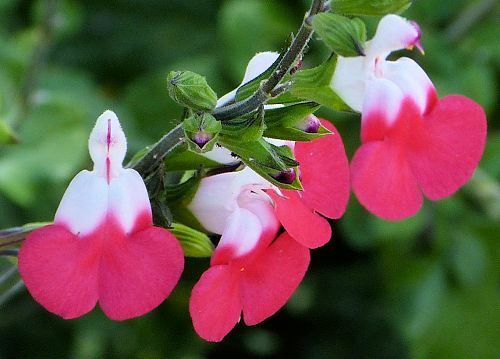 This plant easily cross-pollinates with other salvias, especially Salvia greggii, making identification difficult.